If you’re getting started with a new website it’s likely you’ll want a custom email address to go with it. Or perhaps you just want to get going with a unique email address (even if you don’t want a website yet). In either case, it looks so much more professional to have an email address that uses your business name! In this article I look at how to get started and why it may be preferable to host your email away from your website. The first thing to do, if you haven’t already, is to register your domain. My article here on What domains do I need? will help you make the best choice of domain. In addition I recommend you read 10 things to know about buying website domain and hosting together, as it may not be a particularly good idea to purchase website hosting with your domain seller. Assuming you already know what email addresses you need, you next have to choose where you host them. There are some pros to hosting your email account in the same place as your website. Clearly one supplier means you’ll have one place to go to administer both your website and email. You’ll have a single control panel, one login and one interface to learn your way around. That certainly makes life easier! If you are using a digital agency or website hosting support to help maintain your website they would also be able to help you with your mailboxes. That can be really useful as that team can help you set up your email account on your devices: on your phone, ipad, laptop or desktop. It’s nice to know that you’ve only got one port of call to get support for any problems with your email as well as your website. You will save money if you host your email with your website provider, especially if your host bundles the two together as one price. Make sure you have enough space in your package to cope with the demands of a busy mailbox and website. We have had a good experience using Unlimited Web Hosting for five years now. There are no limits to mailbox sizes in their cloud hosting packages. Their support is all online, but generally pretty fast and efficient. 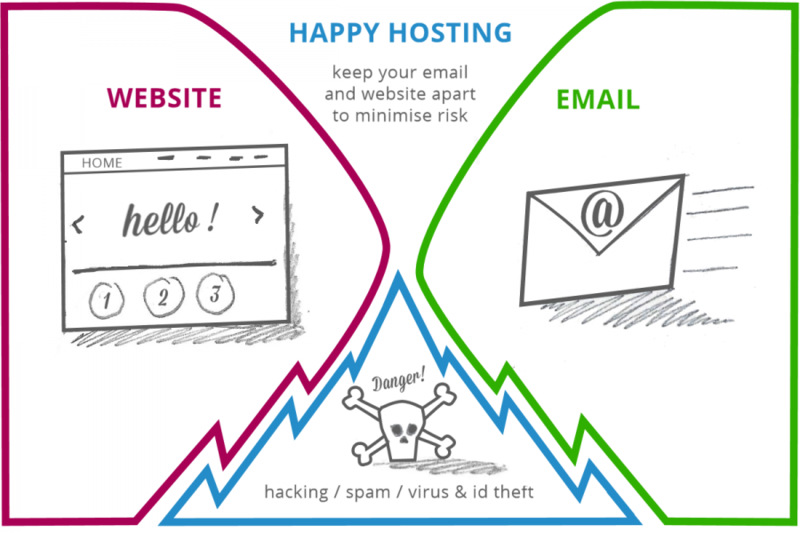 If your website is hacked and your email is using the same hosting account, then the hacker may well be able to access your email through your hosting control panel. You might be susceptible to hacking if you don’t have any security on your website. A hacker might find a weakness or vulnerability that gives them an entry to the back end of your website and from there to the server, where your emails can be found. At the very least you need to make sure your website is protected from hackers with adequate security. And also check with your host to see what security they have in place against such a scenario. 2. Oh no! Your email account is hacked. If your email account is hacked and your account is used to send spam, then you may find that very quickly your hosting provider suspends your hosting account. If your website is hosted in the same place, then everything will get shut down at least temorarily. This is bad news, but potentially very serious for an ecommerce operation. Make sure that wherever you are connecting to your email – phone, tablet, computer – you have reputable anti-virus security installed and kept up-to-date to help prevent this. 3. No email when you need email the most! If, for example, your hosting is shut down because of an incident of hacking or sending spam, you might find there’s an added problem. The email address you use to correspond with your customers, your team and the web host itself, is out of action. Nightmare complication. Usually in that situtation you’ll need to get on the phone with your web host to help resolve the issue, or use a personal email address to deal with that correspondence if you can. As time goes by, you may want to upgrade your website hosting, or move it to a new ISP for whatever reason- service, speed etc. But if you host your email account in the same place, that means your email has to move too. What a pain in the backside, especially for those who have multiple addresses on many devices. Now you have the trouble of archiving all your mailboxes, disconnecting your accounts and having to reset the whole thing on every one of your devices, for every team member using an email address. If your operation is likely to grow, it’s better to keep the email hosted separately so the two are not tied together in the long run. Consequently, it is very much worth looking for a dedicated email package with an internet service provider (ISP). There are many out there and vary in terms of offering, price and the level of customer support. You may want to have large (say 30GB) or unlimited space available for an email account with the ability to send large attachments. Or you may be happy with something smaller to start with. Most people want to read their mails on their phone, tablet and computers, depending on where they are. This requires a protocol to download emails from the server to your device. Make sure you can use IMAP or POP to sync your device mailbox with what’s on your server. POP simply downloads what’s on the server to your device. IMAP is a bit more advanced as it syncs your device with the server and leaves the mail there too – better for a person using multiple devices to check an email account. If you lose your phone or your computer dies, webmail is a great back up system to access your email via a website, like you might look at yahoo mail or gmail for example. You would just need a username and password to login and away you go. To keep the contents of your emails secure as they fly across the world wide web, make sure your provider has encryption activated on both the webmail and the IMAP / POP connections, and on the webmail website. This is something that is increasingly important as big ISPs like Outlook and Yahoo tighten their spam rules evermore. The IP address of your server will essentially be ranked and good, neutral or bad, and your emails will be treated in a corresponding way. You want to make sure that your emails don’t land in other people’s junk mail if possible. There are a multitude of factors to help with this, but IP reputation is a major one. If you host your email in a shared cloud hosting account, you suffer the same IP reputation as the other unknown people on that server. Unfortunately one bad egg who abuses the account and sends spammy emails will spoil the reputation for the rest. With a dedicated server, or an ISP who works hard to keep their reputation ratings high, you have more control over your IP address reputation and therefore how successful sending your emails will be. This is the gold standard of email hosting. It’s a Microsoft service that allows you to sync your Contacts and Calendars as well as emails with a team. Very handy as part of an integrated team solution. Understandably you pay more for more size, better quality of server connectivity (speed), and excellent customer support. Have a look at PC Mags 2018 review of email hosting providers here for a full review of major ISPs. For some people keeping your email and website hosting together will work fine. This would generally suit a small team or sole trader and makes sense if you’ve got someone to help guide you through the risks associated. 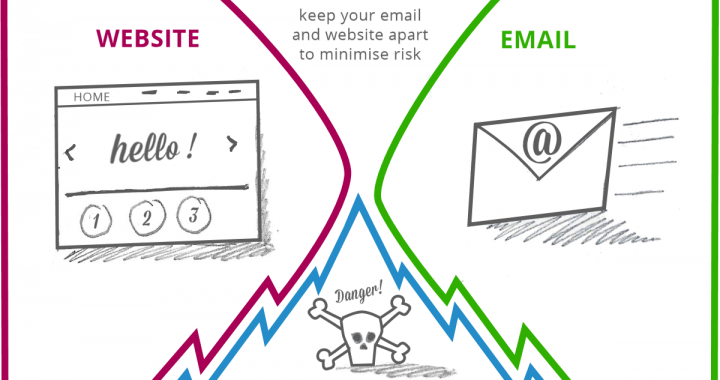 For growing businesses and bigger teams I would definitely recommend keeping your email hosting separate to your website to manage risk and to ensure a better service. 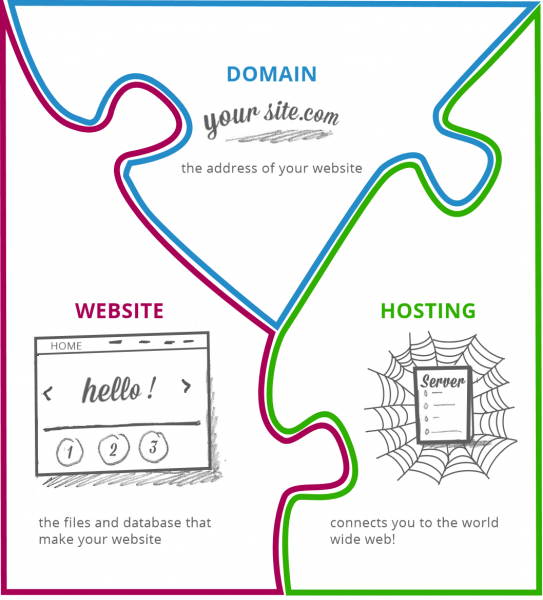 Should you buy your website hosting and domain with the same internet service provider? This is a good question for the person who is about to register their website address, or if your web designer offers to register a domain and host your website too. In this article I am going to give you the pros and cons of buying your domain and website hosting from the same company, or from a web designer. I hope to protect you from costly errors and help you avoid paying more than you need when you buy a domain and hosting packages. Firstly if you are about to choose a new domain, please a take a look at my article What Domains Do I Need? This contains advice on what to check before you choose your domain, and what extras you might want to purchase at the same time. Please explain! What is a domain, what is hosting and why do I need them? I am asked this frequently. If you know this already, jump to the ten things you need to know here. In order to get a website onto the internet, you need three parts of a jigsaw puzzle. This is the address of your website, also known as your URL, which for the geeky amongst us, stands for uniform resource locator! But enough of that. It is like your mobile phone number: you want to have one, and you want it to stay the same for as long as you need it. You want it to be portable when you get a new phone or when you switch service provider. The same goes for your website domain: it should be easily portable if you change websites or hosting providers. These are the files (and database) that put together make your website appear on a computer screen. You can have a website on your local computer at home, but nobody would see it unless it is hosted publicly and has an address. It is like your mobile phone. You can hold it in your hand, but it’s not useful until you have a telelphone number and a network provider. This is like your mobile phone network service provider. It connects your website to the world. 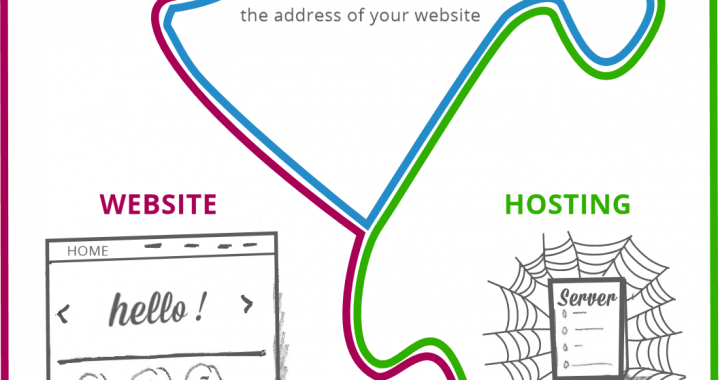 It is the ‘place’ your website files and database must be saved and the ‘place’ your domain URL must point to. There are a few choices as to what service level you might need. For a starter website usually a shared cloud hosting package is sufficient. If you have want super-fast hosting, have high visitor numbers or peaks of traffic, or you are unsure about a shared service due to security concerns, you may choose a dedicated server. The latter is naturally more expensive. It is likely that the company you register a new domain with may offer you lots of seemingly attractive extras, including website and email hosting. But should you buy them all together or keep them separate? And should you accept an offer from your web designer to register a domain for you? The golden rule! When you buy a domain, you need to make sure that it is registered in your name, or your company name. This domain needs to be within your control as it may be a significant business and branding asset. I would recommend that you register your own domain – there are instructions on how here – and don’t get the agency building your website to do that. Most website designers and developers are absolutely trustworthy, but they will probably put your domain in with a lot of others in a company account, so you won’t have your own access to it. Importantly, there may be occasions where relationships break down, or you lose contact. Certainly, you don’t want to find that the person you’re in a dispute with can actually control what appears on your website because they control your domain. Fairly often I am asked to help rescue a website which the client cannot access because they do not have hosting access or domain access either. This can be a time-consuming process to resolve. I have also experienced the ‘designer with a grudge’, who pleasantly grafittied my new client’s existing website during the domain ‘Transfer out’ process. We were helpless at that time to stop him. Similarly, if you want to move to a new website designer or support, having control over your domain will seriously ease the process of switching to a new supplier. This is because you can simply change the place the website address points to, without having to deal with a potentially disgruntled incumbent supplier. If the worst comes to the worst, domain sellers and regulators have procedures for you to claim a domain name that is rightfully yours, but it’s a process to be avoided. If you have a .uk domain, Nominet is the regsitry organisation that can help you retrieve access to your domain. If you are not confident, or very busy, it’s certainly easier to delegate this task, so if you’re not too concerned about control and your website designer does register the domain for you, then please ask them to register it in a new account with your details, so you at least have your own login. 7. How many years do you want to register it for? It may seem cheap to see your domain is only 99p, but be aware that it is usually only the first year that is such a low price. When you add your domain choices to your basket, beware that the company you’re buying from may add a 2-year or a 3-year registration. Usually there’s a bulk saving buying more years, but only if you need then. Simply buy one year if you don’t. Another tricky practice for us common consumers to look for is that, like car garages, domain sellers tend to put on the VAT at the end of the bill, not in the initial price quoted. That can push your total up somewhat! Usually a web host and domain seller bundle their products, so you might see a free domain if you buy hosting at the same time. The pros: it’s usually a good price to buy both together. You’ll only have one login and one company billing you. The cons are really about security. The main thing is that if you buy your website hosting and domain with one provider and your hosting account is hacked, there’s potential for the hacker to not only gain control of your website, they may also be able to control your domain name. That can leave you with a big problem. At the very least, make sure you practise good password security on your hosting account. Keep them separate and if somebody hacks your website they cannot get hold of your domain as it’s somewhere else. Similarly if you fall out with your web host, you can ditch them much more quickly as your domain is somewhere else. As mentioned, it’s much more easy to port your website across to another host than it is to try and get hold of a website that is in somebody else’s hands. 10. What about email hosting? You’re likely to want an email address using the same address as your website. I’ve written another article about where you host your email here. 11. Search Engine Optimisation packages and other marketing tools. My view is that you can save this for later. It’s not something you’ll need until you’ve got a website up and running, so I’d put this one hold when you register a domain. I hope this article answers any questions you may have about whether you should buy domain and hosting with the same provider. There are no hard and fast rules, just please remember that your domain is to be protected. Please ask any question in the comments below, or ping me an email using our contact form.